People with HIV are living longer thanks to lifesaving treatments, but as they age, they can face new complications like HIV-related heart disease. The REPRIEVE trial confronts this emerging challenge to learn how people with HIV can live in good health even longer. For more information, please check out www.reprievetrial.org or contact us at 973-972-3811. HPTN083: GIVE PrEP A SHOT! HPTN083 is a research study that compares the effectiveness of injections and oral tablets as pre-exposure prophylaxis (PrEP) to prevent HIV. For more information, please check out www.giveprepashot.org or contact our Community Engagement Team at 973-972-9069 or giveprepashot@njms.rutgers.edu. 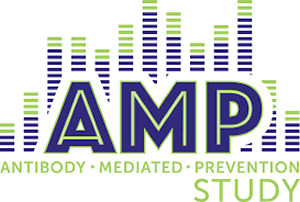 AMP stands forAntibody Mediated Prevention. This is the idea of giving people antibodies to see if they will protect against HIV infection. This study, also referred to as HVTN 704/HPTN 085, tests a new idea for HIV prevention. In traditional vaccine studies, we give people a vaccine and wait to see if their bodies will make antibodies against HIV in response. In this study, we’ll be skipping that step, and just giving people the antibodies directly. We will do this through an infusion, which some people know better as getting an IV or getting a drip. This is the first study testing whether this antibody can prevent HIV infections in people. For more information, please check out www.ampstudy.org or contact our Community Engagement Team at 973-972-9069 or RUAMPNJ@NJMS.RUTGERS.EDU.